This code sample creates a Word document containing the selected contact's name, address, phone number and contact photo. This sample uses a new, blank Word document, however, you could use a Word template with either bookmarks or merge fields for the contact data. If the contact has a home address or phone, that is used in the printout, else the business address or phone is used. If a photo is not assigned to the contact, it uses a placeholder image. The contact photos are scaled to 36 pixels high. If the image is more then 134 pixels wide after the height is scaled, the image is reduced to 100 pixels wide. The document is hidden until the macro finishes. If you want to watch the macro create the entries, put oWord.Visible = True right after oWord.Documents(1).Activate. To use, paste the code into the VBA editor and create a folder under Documents called Logos. Rename an image placeholder.jpg, to use for contacts who don't have a photo and put it in the logos folder. Select the contacts you want to print (use Ctrl+A to select all) then run the macro. This is a Outlook macro. 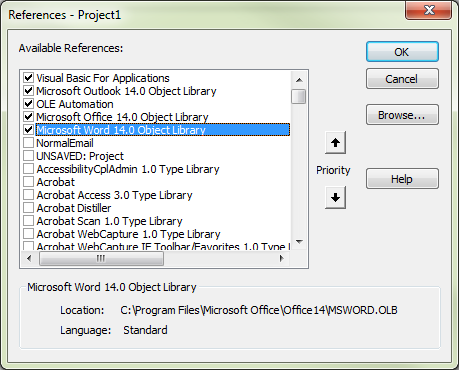 You need to set a reference to the Word object library in the VBA editor's Tools, References menu. MsgBox "You need to select Contacts first!" filename = oContact.FirstName & oContact.LastName & ".jpg"
imagePath = enviro & "\Documents\Logos\placeholder.png"
To check your macro security in Outlook 2010 and newer, go to File, Options, Trust Center and open Trust Center Settings, and change the Macro Settings. In Outlook 2007 and older, it’s at Tools, Macro Security. If Outlook tells you it needs to be restarted, close and reopen Outlook. Note: after you test the macro and see that it works, you can either leave macro security set to low or sign the macro. If you receive a "User-defined type not defined" error, you need to set a reference to another object library. For this macro, it would be Word's object library. Go to Tools, References menu. Locate the object library in the list and add a check mark to it. HI there - could you tell me where i can find the word object model? It's listed in Tool, References under Microsoft Word Object Library. You need to add the Word object model in the VBA editor's Tools, References to avoid that error message. "Outlook ChangeNotifierAddin 1.0 Type Library"
Also, I have outlook already configured in my laptop with a working outlook email id. Are you using the macro in outlook or word? it's an outlook macro. Also, those two libraries you checked should be unchecked; one is the itunes sync addin, not sure about the other one, but they don't have any effect on this. While the macro could be tweaked to work in word, its an outlook macro.